Features an inset map of the environs of Mecca. 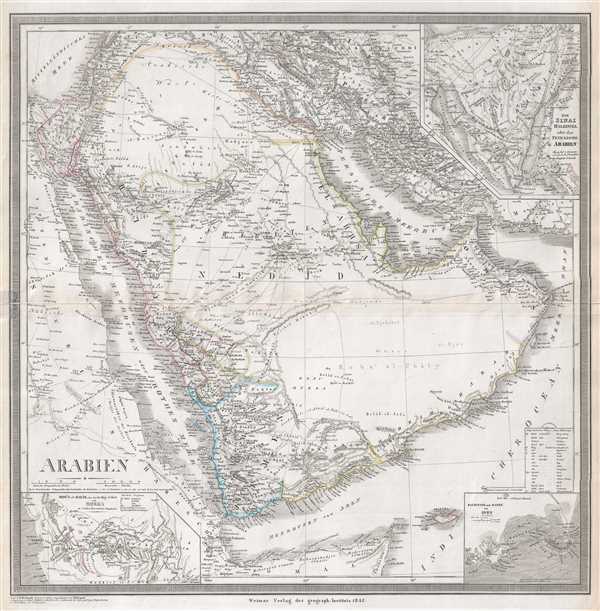 This is an 1848 Heirich Kiepert map of the Arabian Peninsula. The map depicts the region from eastern Africa to Isfahan and from Lebanon, Syria, and Iraq to the Horn of Africa and the Indian Ocean. Highly detailed, myriad locations along the region's coastlines are labeled, along with numerous, cities, towns, and villages, including Mecca and Medina, the two holiest cities of Islam, and Riyadh (Er-Rijid). Other cities, including Jerusalem, Beirut, Baghdad, Basra, and Isfahan are also labeled. The countries of Bahrain, Oman, and Iran are noted, while the rest of the Middle East is part of the Ottoman Empire. An inset map of the Sinai Peninsula is situated in the upper right corner, along with an inset of the Gulf of Aden in the lower right corner and an inset of Mecca and its environs is located in the lower left corner. This map was created by Heirich Kiepert from a map by Carl Ferdinand Weiland and published by the Geographishces Institut in 1848. Heinrich Kiepert (July 31, 1818 - April 21, 1899) was a German cartographer and historian active in the mid to late 19th century. Kiepert was born into generous circumstances that allowed him to develop his childhood interest in geography and history into a serious profession. His teachers included the historian Leopold von Ranke and the philologist August Meineke. Dissapointed with the poor quality of maps in historical school books, Kiepert set out to correct the problem. His first major work, the Atlas von Hellas und den hellenischen Kolonien, was published with Karl Ritter in 1840. The work immediately won accolades from the academic community. A number of similar publications followed, including the 1848 Historisch-geographischer Atlas der alten Welt, the 1854 Atlas Antiquus, and the 1894 Formae Orbis Antiqui. In 1854 he took a position as professor of Geography at the University of Berlin and for nearly 50 years was considered the go-to man with regard to the cartography of classical and biblical antiquity. Kiepert died in Berlin on April 21 of 1899. Very good. Wear and toning along original centerfold. Verso repair to centerfold separation. Old tape repairs on verso. Blank on verso.